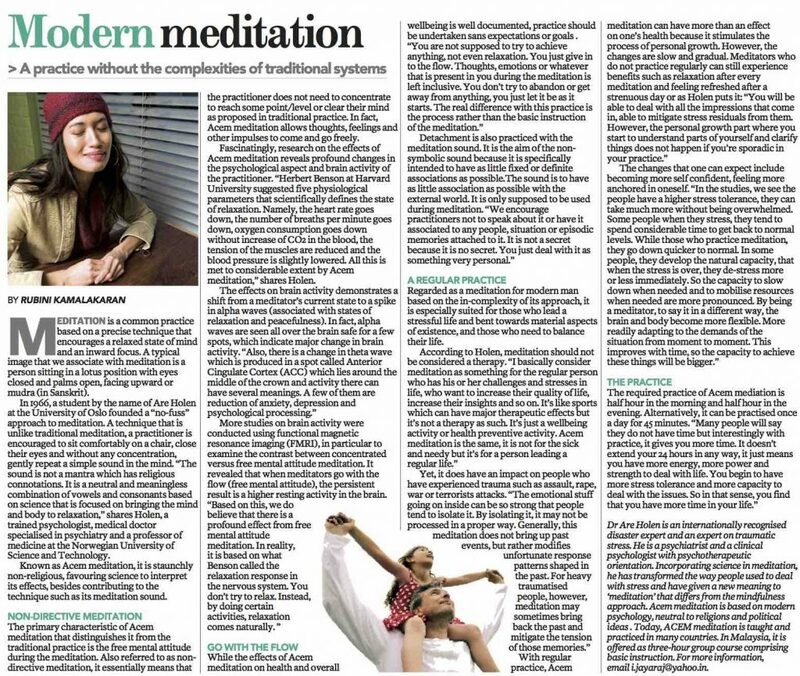 Under the title “Modern Meditation – A practice without the complexities of traditional systems”, the Malaysian newspaper The Sun has recently published an interview with Acem’s founder Dr. Are Holen. Acem Meditation, starting in Norway in 1966, is described as a “no-fuss” approach to meditation – a non-religious technique that is unlike traditional meditation – one sits comfortably and gently repeats a simple sound in the mind. The Acem approach, we are told, is especially suited for those who lead stressful lives and need some balance. The free mental attitude during meditation, also referred to as non-directive meditation, is a central characteristic. One does not need to concentrate to reach some point or level or clear one’s mind as proposed in traditional practice. In Acem Meditation, thoughts, feelings and other impulses are allowed to come and go freely. The article quotes Dr Holen as saying that meditation is for the regular person who has his or her challenges and stresses in life, who wants to increase the quality of life, and increase his or her insights. It is a wellbeing activity, but not therapy; not for the sick and needy, but for a person leading a regular life. Some people, when they stress, tend to spend considerable time to get back to normal levels, while those who practice meditation go down quicker to normal. The interview was published in The Sun on 31 March 2016 on p. 20.